Better late than never? We present to the world the front page of the issue of the Plainsman following Auburn’s championship-clinching win over Georgia in 1913. You almost get the feeling Richard Billingsley is surprised he hasn’t heard from Auburn… not that a phone call to Hugo, Oklahoma, where the college football historian marinates in the minutia of gridirons gone by day in and day out, is required to claim a national championship. The athletic departments from Texas A&M and Minnesota and Ole Miss contacted him before publicly embracing his research (“they were just verifying the information”), but no one at Oklahoma did. The Sooners, says Billingsley, “just saw it in the record book and took it upon themselves”—if not on the side of the stadium, like the Aggies, then at least on their website. Auburn, he says, should feel very much free—if not compelled—to do the same, phone call or not. “My national championship for Auburn in 1913 is a very valid national championship,” he t0ld me when I got him on the phone in July. Valid and exciting to watch. It was August 19, 1995, a Saturday. 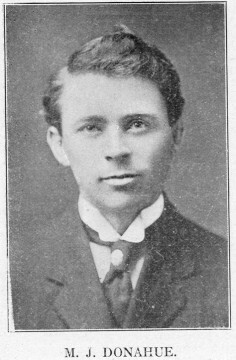 “I remember my thoughts well on the day the printer rolled out that final rating for 1913 because I was living in SEC country at the time in Nunnelly, Tennessee,” says Billingsley, whose exhaustive examination of nearly 150 years worth of college football results earned his computerized Billingsley Report ranking system official NCAA recognition as a national championship selector in the mid 1990s, as well as inclusion in the formula that determines the BCS national champion. 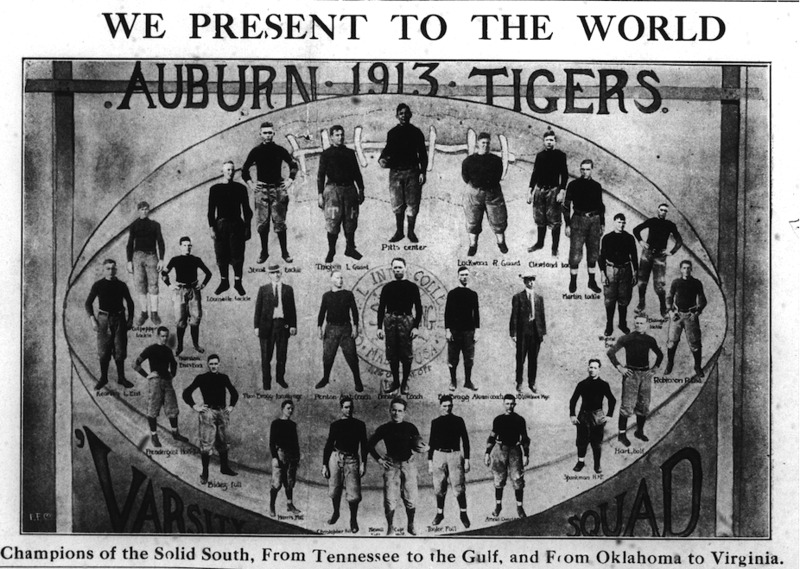 The 1913 Auburn Tigers went 8-0-0. Practically half of them were all-conference, or all-southern, and coached by Gentleman Mike Donahue (the South’s Little Wizard), who in 1951 was named a member of the College Football Hall of Fame’s inaugural class (three years before John Heisman). They outscored their opponents 224-14 (next year, with even less talent, it was 193-0, seven of which knocked off Midwestern powerhouse Carlisle). They were one of the south’s best teams ever. They were one of the country’s best teams ever. They were S.I.A.A. champions. The Billingsley Report says they were national champions. The NCAA says they were national champions. Common sense says they were national champions. “When I began to see Auburn’s performance, week by week, especially when I got into November, and could see them outperforming expectations in the last three games, it was exciting for me and shocking for me to see what was happening,” Billinglsey says. Their first five victims: Mercer, Florida, Clemson, Mississippi State, LSU. But those last three games, or at least two games, were shocking for Auburn fans at the time, too—not the winning part, the being scored on. Georgia Tech? 100 years ago, Auburn beating Georgia Tech was like the sun rising every morning—you technically didn’t know for sure that it would happen… but you knew for sure that it would happen, no matter how good a season Heisman’s Ramblin’ Wrech was having. 1913 was more of the same, 21-0. The gist of the Plainsman’s headlines following the Vanderbilt game, however, wasn’t Auburn Wins—it was Vandy Scores. So strong was Donahue’s legendary defense, the mighty Commodores (under offensive genius Dan McGugin) managing to cross the Tigers’ goal line was as newsworthy as Auburn beating southern football’s overlords for the first time in seven tries, 14-6. The final game of the season, a 21-7 win over Georgia, was even more alarming; the Bulldogs scored… and they scored first. It was the first time Auburn had trailed all season, the last time they would trail or even be scored on for two years. But it gave Auburn students and alumni the kind of celebration and joy only comebacks can, the perfect capper to a perfect season in which every S.I.A.A. team Auburn destroyed was undefeated in the conference. Until they played Auburn. “I felt like I was witnessing history being made,” Billingsley says of the week he crunched the numbers. He doesn’t mean Auburn history, he means southern history. 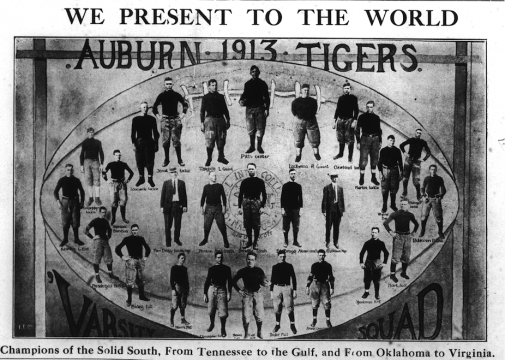 Billingsley says the 1913 Auburn Tigers challenged his own preconceived notions about early 20th century football below the Mason-Dixon line. The teams that share the 1913 national championship entry with Auburn in the official NCAA record book thanks to other official selectors? Harvard and the University of Chicago. Auburn deserves it more than either of them, Billingsley says. Dig as deep into the century-old details as Billingsley has, and you’ll quickly discover that the Tigers’ only weakness was winning and winning and winning in the final days of an era that deemed those wins irrelevant, at least on the national stage. Nor, apparently, did Auburn players. Bradley Streit, an All-Southern fullback for the Tigers who led the S.I.A.A. in scoring in 1910, transferred to eastern powerhouse Princeton after two years at Auburn and proceeded to dominate the Ivy League in… 1913. The other Tigers named him their best player, and he set a Princeton record for most points scored in a game by a single player that stood for 54 years. 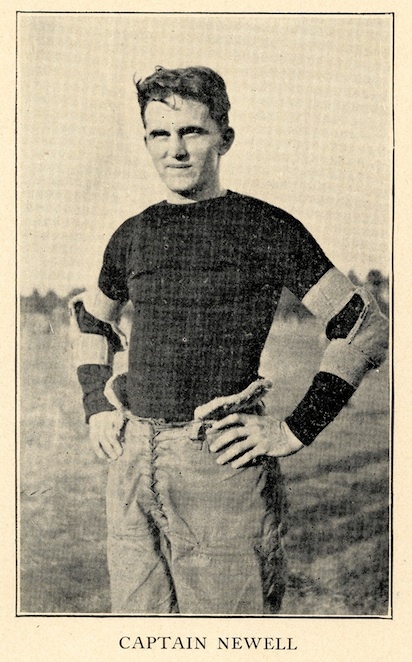 “Streit has attracted the attention of the football world by his great line plunging, doing practically all of the scoring for the Princeton team this season,” the Auburn Alumnus wrote in 1914. According to Auburn historian Michael Skotnicki, Streit later said his 1910 Auburn team was far better than his 1913 Princeton squad. Billingsley, as well as a growing number of Auburn fans, thinks Auburn University should celebrate the success of at least one of those teams to the fullest extent possible, something beyond three words in the back of the media guide. “One thing Auburn’s Athletic Department needs to keep in mind, they really need to know that they have a right to claim this national championship based on the Billingsley Report,” he says. You can read more about Billingsley’s methodology here. 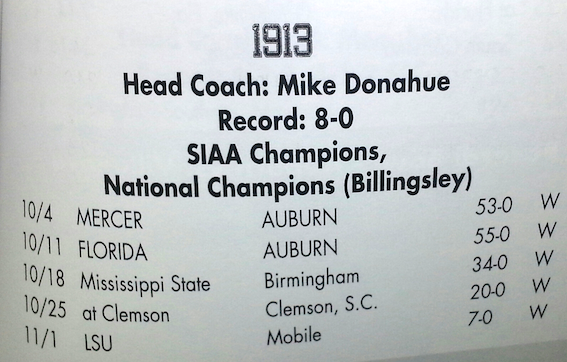 The War Eagle Reader’s book on Mike Donahue and the 1913 season will be available this fall. Related: Rational Champions: Birmingham lawyer’s new book argues Auburn should claim seven more national titles. Great article, Jeremy. Auburn should claim the 1913, 1983, and 1993 national championships. I don’t see why we don’t claim this title. Auburn can be it’s own worst enemy at times! We earned this title we should claim it! Thanks for sharing this WER! What a fantastic article. It would be the perfect time to finally recognize the 1913 National Championship, too – on this, the 100th anniversary of it. What is holding the Auburn Athletics Department back? Do we need a groundswell of public support to sway Jay Jacobs? I feel like Auburn should claim what is their’s. I am surprised the school isn’t jumping all over this article. I also feel like Auburn should have a share of the BCS title from the ’04 season! WDE 4EVER! Great article. There is no doubt about 1913 and it should have already occurred. For traditionalist after poll era began ’83 is not very clear cut and is more like some of the yellow hammers.